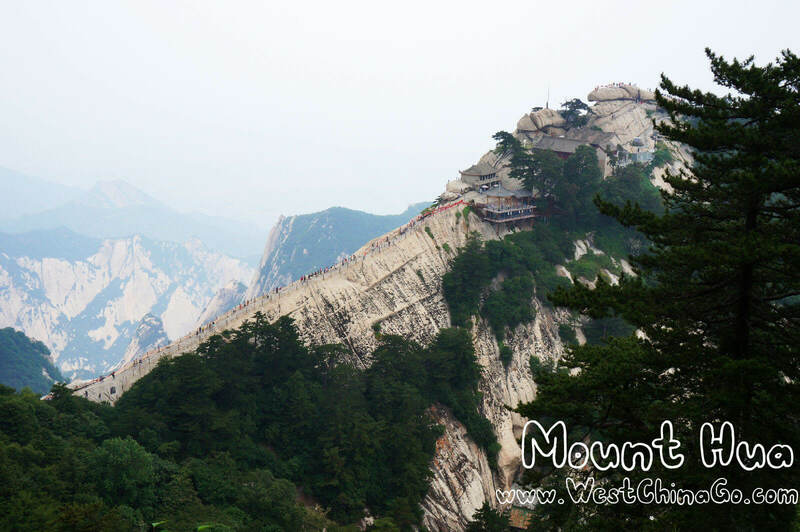 Traditionally, only the giant plateau with its summits to the south of the peak Wuyun Feng (五雲峰, Five Cloud Summit) was called Taihua Shan (太華山, Great Flower Mountain). It could only be accessed through the ridge known as Canglong Ling (蒼龍嶺, Dark Dragon Ridge) until a second trail was built in the 1980s to go around Canglong Ling. Three peaks were identified with respective summits: the East, South, and West peaks. The East peak consists of four summits. The highest summit is Zhaoyang Feng (朝陽峰, Facing Yang Summit, i.e. the summit facing the sun). Its elevation is reported to be 2,096 m (6,877 ft) and its name is often used as the name for the whole East Peak. To the east of Zhaoyang Feng is Shilou Feng (石樓峰, Stone Tower Summit), to the south is Botai Feng (博臺峰, Broad Terrace Summit) and to the west is Yunű Feng (玉女峰, Jade Maiden Summit). Today, Yunű Feng considered its own peak, most central on the mountain. The South peak consists of three summits. The highest summit is Luoyan Feng (落雁峰, Landing Goose Summit), with an elevation of 2,154 m (7,067 ft). To the east is Songgui Feng (松檜峰, Pines and Junipers Summit), and to the west is Xiaozi Feng (孝子峰, Filial Son Summit). The West peak has only one summit and it is known as Lianhua Feng (蓮花峰) or Furong Feng (芙蓉峰), both meaning Lotus Flower Summit. The elevation is 2,082 m (6,831 ft). 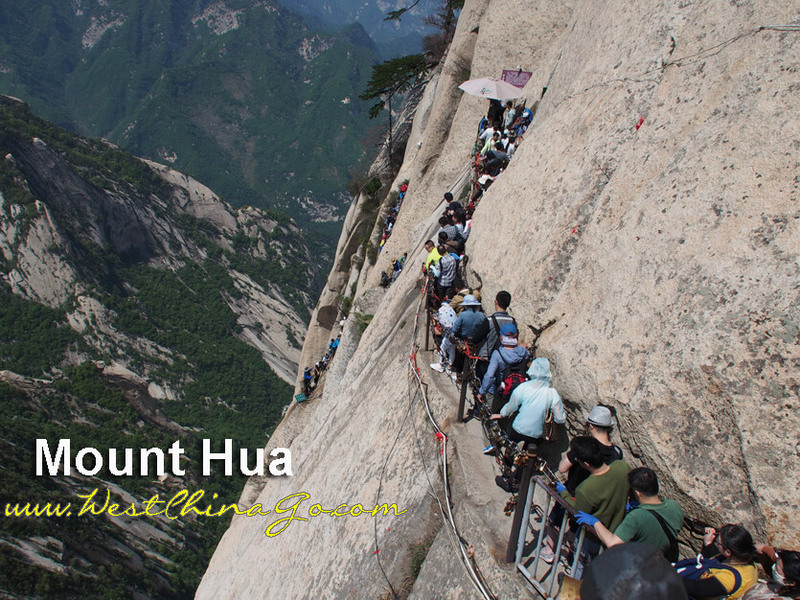 With the development of new trail to Hua Shan in the 3rd through 5th century along the Hua Shan Gorge, the peak immediately to the north of Canglong Ling, Yuntai Feng (雲臺峰, Cloud Terrace Peak), was identified as the North peak. It is the lowest of the five peaks with an elevation of 1,614.9 m (5,298 ft). It includes the main peaks scenic area, Jade Spring Temple, Xianyu Scenic Area and Xiyue Temple. The ticket is valid for two days. Wengyu Tourism Bus runs between Tourist Service Center and Donggoukou, the lower station of West Peak cable car. It costs CNY 40 for a one-way trip and CNY 80 for a round trip. Visitors can get off at White Sparrow Temple. After visiting the temple, continue to take the cable car to the West Peak. Notice: Huangfuyu Tourism Bus runs between Tourist Service Center and Wamiaogou, the lower station of North Peak cable car. It costs CNY 20 for a one-way trip and CNY 40 for a round trip. We ensure you an enjoyable and hassle free journey with our fully qualified experienced drivers, well-conditioned serviced vehicles and auto insurance coverage. Take a regular tourist bus from the east square of Xian Railway Station to the Jade Spring Temple at the foot of the Huashan Mountain. It operates between 06:00 and 19:00. The one-way ticket costs CNY 38 and round-trip ticket costs CNY 70. A single trip takes two hours or so. *Take subway line 1 to Xian Fangzhicheng Bus Station and take a bus to Huayin. The bus runs every 30 minutes between 07:45 and 19:00. The bus ticket costs CNY 37.5 and a single trip takes about 2 hours. Note: Tourism Bus Line 1 from the east square of Xian Railway Station to the mountain is out of service at present. 1. There are high speed trains running from Xian North Railway Station to Huashan North Station, taking 30 – 40 minutes. After arrival, take the free minibuses in green outside the station to the mountain. 2. A normal train from Xian Railway Station to Huashan Station takes 1.5-2 hours. After arrival, take bus 608 to Baoliandeng Square, aka Huashan Shengtai Square, which is near the entrance of the mountain..
Take a taxi from Dongshanmen Parking Lot to Huashan North Station with a cost of about CNY 25, and then take high speed trains back to Xian. There are many tourist buses from the Jade Spring Temple to the east square of Xian Railway Station and just leave when a bus is full. The ticket fare is CNY 38.